We can go further, defining a function to compute each sub-part of the house. Warning: Do not make a function called window because window is already used by p5js. Notice also that I can use mouseX and mouseY as arguments. Now without editing the house() code, I can use house as a “concept” just like rect or ellipse. Write a loop to draw 10 houses using the house function. We talked about syntax — the structure of the text that represents a program. Programming language syntax is described by formal grammars. Here “formal” means precise or mathematical as opposed to, say, grammars for natural languages such as English, which has no precise or formal definition. 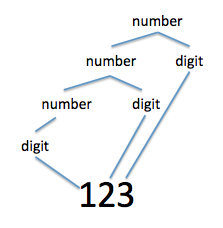 A simple grammar for numbers can be described using a meta-language (a language that describes a language!). In the metalanguage, ::= means the thing on the left can be replaced by the pattern on the right. The vertical bar (|) means choose either of two patterns. Brackets [ ] enclose optional elements. Any place a statement is allowed, you can substitute a compound statement. Notice this explains semicolons as well: semicolons are merely statement separators in compound statements. Notice that any expression can be enclosed in parentheses as shown by ( expression ). There are relatively few rules that can “generate” infinitely many programs. All expressions have the same syntax and follow the same rules. Similarly, all statements are the same (but like expressions, they are recursively defined.